Before you click on Reports, make sure that the archival description you are viewing has child records that correspond to files. 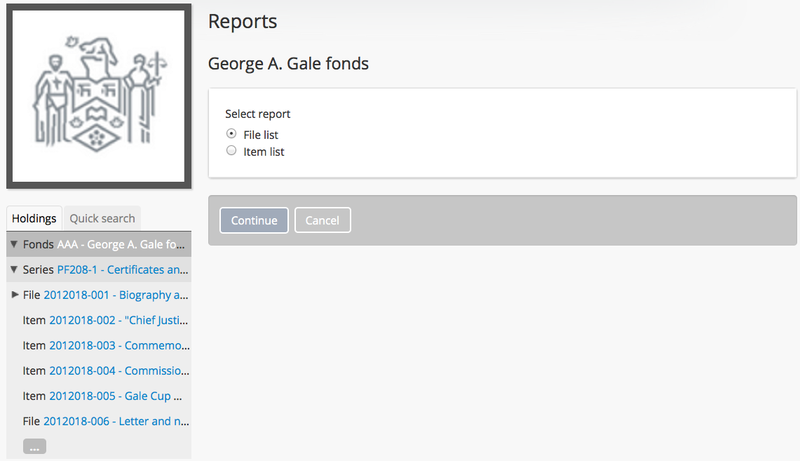 If the archival description does not have any information at the file-level, you will not be given the option to create a file-list report. AtoM’s file list report is hard-coded to use the “File” level of description term in the “Levels of description” taxonomy. If you have edited or removed the “File” term from the taxonomy, the report will not work! Alternatively, if you are logged-in as Admin, AtoM will load the page with the additional options: physical storage locations and box label CSV. Select the Continue button, and AtoM presents a report criteria page for the public user, which provides the following sort options: reference code, title and date (based on start date). If you are logged-in, selection of the Continue button will take you to a report criteria page, which provides the following sort options: reference code, title, date (based on start date) AND retrieval information. Select the Continue button and AtoM will load the print preview page for the file list report. The example below shows the file list report for a logged-in user. Notice the extra column with retrieval information, which is the physical storage location.